The City of Chattahoochee, the westernmost municipality in Gadsden County, is located on the banks of the beautiful Apalachicola River, the southernmost portion of the 38,000 acre Lake Seminole, home of the Jim Woodruff Hydropower Dam, with northern city limits the State of Georgia and home of the Florida State Hospital. Chattahoochee is a great place to live and retire, full of vacation and business opportunities, and home of the friendliest people in Florida. Give us a look and you will want to join us. We are centrally located being 60 miles from Dothan, Alabama, 45 miles west of Tallahassee, 75 miles from Panama City and only 4.5 hours from both Atlanta and Orlando. If you love the foothills of North Georgia, come and feel at home with us. Click here for more information. 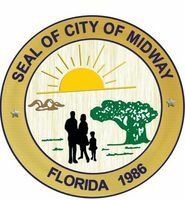 Midway is located in Gadsden County about ten miles from Tallahassee, the Capitol of Florida. We are conveniently located near the intersection of two major highways - Interstate 10 and US Highway 90. You can have all the comforts of rural Florida, yet be only fifteen miles away from major shopping malls, two universities and a community college. Click here for more information. Welcome to the Town of Havana! We are nestled 14 miles north of Tallahassee in beautiful Gadsden County, Florida. Come and visit our Antique/Specialty Shops, Art Galleries, and Fine Restaurants. You will find Havana's unique charm and small town atmosphere very inviting. The Town of Havana was voted "Florida's Friendliest Small Town" in 2005 and 2007 by readers of Florida Monthly Magazine. Click here for more information.